← Power Man and Iron Fist to Get New Comic in the New Year! In the grand world of comic book superheroes, one of my favorite super-powers is the ability to turn 2-dimensionally flat. I’ll explain why in a minute. It’s just such a weird, interesting power. Sometimes stretching is involved, sometimes its not. Mostly it’s just about getting totally flat. Some heroes can lift 100 tons! Some can run faster than the speed of sound! Some are really, really good with a bow and arrow! But who cares about all of those fancy, famous superheroes? It’s far more interesting to explore the weird and obscure heroes, those with the power to become flatter than a pancake. One has to assume it’s a more useful power than it appears. 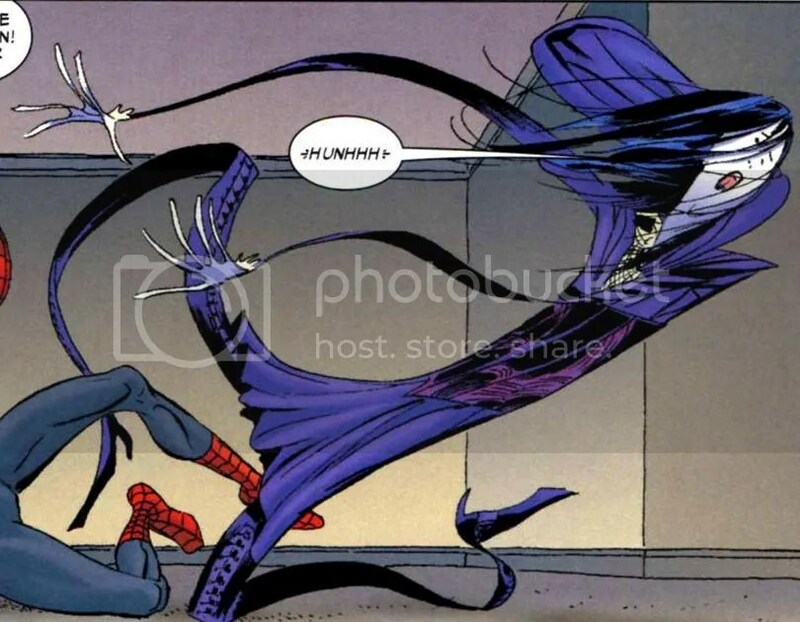 Paper Doll was one of the new villains introduced to Spider-Man during Brand New Day, when Marvel cast Mary Jane aside and attempted to give Spider-Man a new lease on awesomeness. As I’ve written about before, that whole concept crashed and burned. Paper Doll was flattened in her father’s dimensional compressor machine, because of course she was. She then went on to use her flattening powers to kill anyone who got close to actor Bobby Carr (she had an obsession). Along with flattening herself, she could flatten her victims, and they wouldn’t survive. It was pretty gruesome. But as one might expect, Spider-Man put a stop to that and she hasn’t been seen since. You knew there’d have to be a mutant on this list with flat powers. Unfortunately, Tommy is a bit of a tragic story. She’s one of the Morlocks, the mutants so freaky looking and scared of the world that they fled into the sewers. I don’t think she looks that bad. The tragedy comes from the fact that Tommy unknowingly helped lead the villainous Marauders into the sewers, where they proceeded to slaughter her friends and Morlock family. Tommy was no exception. She was one of the first to be killed in the infamous Mutant Massacre. 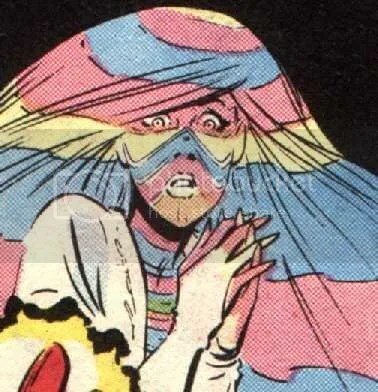 A shame, really, but she did get a cameo on the X-Men animated series from the 90s! That’s got to count for something. This character is kind of brilliant. 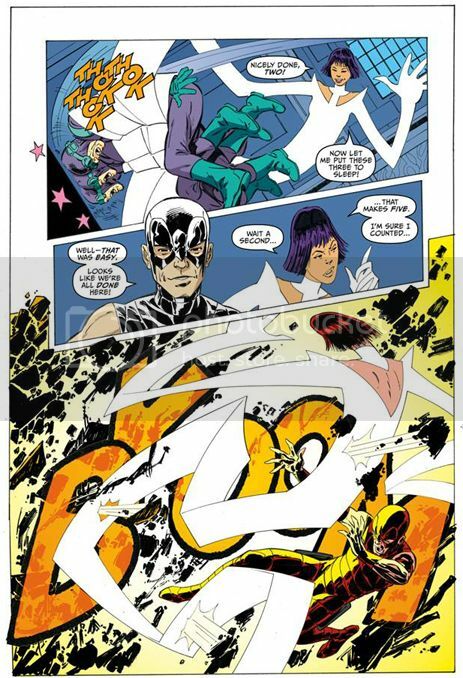 Legendary writer John Byrne decided to create a new superhero comic for IDW. Calling it Trio, he created three new heroes: One, Two and Three. Together, they are essentially Rock, Paper and Scissors. One is flat and stretches, Two has arms that turn into blades, and Three is a rock monster, kind of like the Thing. Byrne turned Rock, Paper, Scissors into a superhero comic! There’s not much info on the web, but apparently the comic was kind of an homage to the Silver Age, and a bit too much at times. It doesn’t appear that very many people liked it, and it sounds like One was kind of a useless character in the series itself. But the very concept is just brilliant enough to be silly! Or maybe vice versa. Ron-Karr is my boy. He is where my interest in flat characters begins. Ron-Karr is from the Legion of Superheroes in the Silver Age, back when they were a little more goofy. One of the classic events in Legion comics of the time were the tryouts for new members. The writers would create a bunch of one-off characters – like Arm-Fall-Off Boy – just to have them try out and fail to make the cut. Some would succeed and join the team, obviously, but there were a lot of rejects. Ron-Karr was one of the rejects. The Legion just didn’t care about his ability to turn flat. And I owned a copy of the comic where Ron-Karr tried and failed to join the team. I also owned a Legion of Superheroes guidebook, with biographies of all major and minor characters. And I discovered that, for reasons I may never know, the writers decided to randomly pluck Ron-Karr from his original one-panel tryout appearance and make him a member of the Legion of Super-Villains! This nobody, throwaway character was randomly pulled out of obscurity and given a bigger, niftier role, and I love that sort of thing in comics! Granted, he wasn’t much of a villain, and eventually joined the good guys for real. But just that one silly factoid was enough to make Ron-Karr one of my random favorite characters in comics. Flat superheroes rule! Also, he was from Neptune, for some reason. 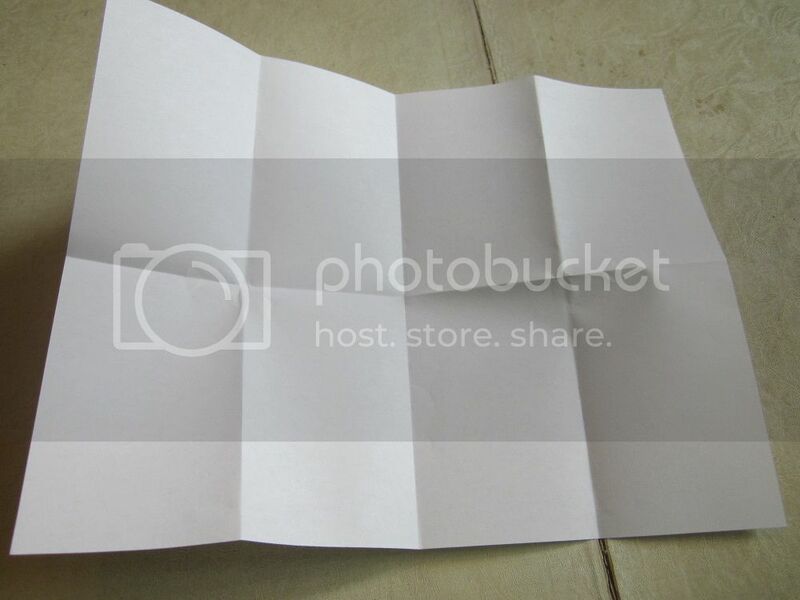 Even the speech bubbles are folded! Apparently, coming up with names for your flat characters can be pretty tough. Because c’mon, the ‘Folded Man’? What the heck is that about? Anyway, The Folded Man is a Flash villain who never really amounted to anything. His real name is Edwin Gauss, and he’s a genius MIT graduate who developed his suit to complete Einstein’s Unified Field Theory. He uses the suit to travel between the second and fourth dimensions. Pretty nifty. But like I said, he never really accomplished much. But he’s still flat, and he stands a chance of appearing on TV when The Flash reaches, like, season 5 or something. Whenever The Flash starts scraping the bottom of the barrel for super-villains-of-the-week, the Folded Man stands the best chance on this list to make the jump to The CW! 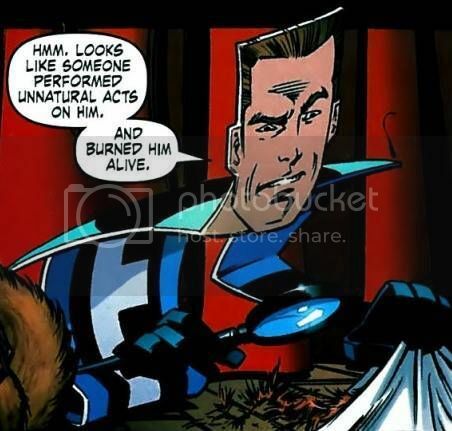 Flatman is basically a poor man’s Reed Richards. 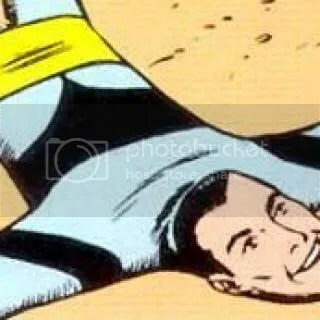 He’s got the same stretchy powers, he wears a nearly identical costume; but the key difference is that Flatman is flat. Sure, Reed Richards can turn himself flat, but Flatman is stuck that way. It’s right in the name! 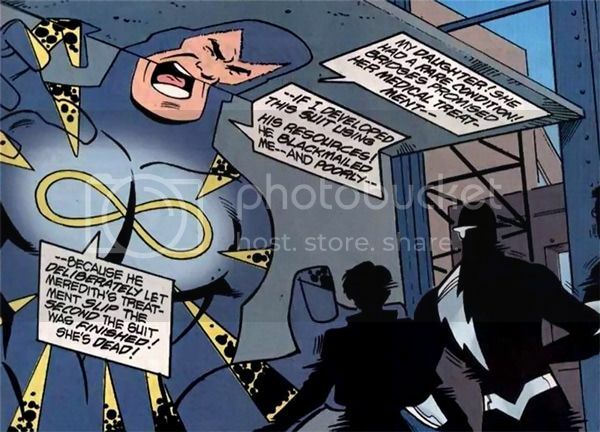 Flatman is Val Ventura, a member of the Great Lakes Avengers! Why does Wisconsin need its own Avengers team? It doesn’t! That’s the joke! Badum bum. Flatman and his whole team are a bit of superhero comedy in the Marvel Universe. But the important thing is that his heart’s in the right place. Also, he’s adept at folding his body like origami! So at least he’s got that going for him. Posted on October 7, 2015, in Comics, Lists of Six!. Bookmark the permalink. 3 Comments. The only other flat character I can think of is the Shadow Thief….since….he’s a shadow. I think he was just being polite.